A day in the life of an Indiana University student. Senior Chesley Swann had never been to Indiana University Bloomington before his first day of orientation. The Washington, D.C., native knew he wanted to work in public policy. After hearing about IU's School of Public and Environmental Affairs program and the overall atmosphere at IU, he enrolled, campus unseen. "I had heard about IU through my mentors (and IU alumni) back in D.C.," Swann said. "I knew I wanted to go into public policy, and SPEA has such a great program, so I was instantly drawn to that. I was also drawn to the overall atmosphere and IU experience that so many people told me about." Growing up in D.C. gave Swann a front-row seat to policy decision-making and both the positive and negative effects it can have on communities. His father is retired law enforcement, and his mother has spent more than 30 years working for the Environmental Protection Agency. 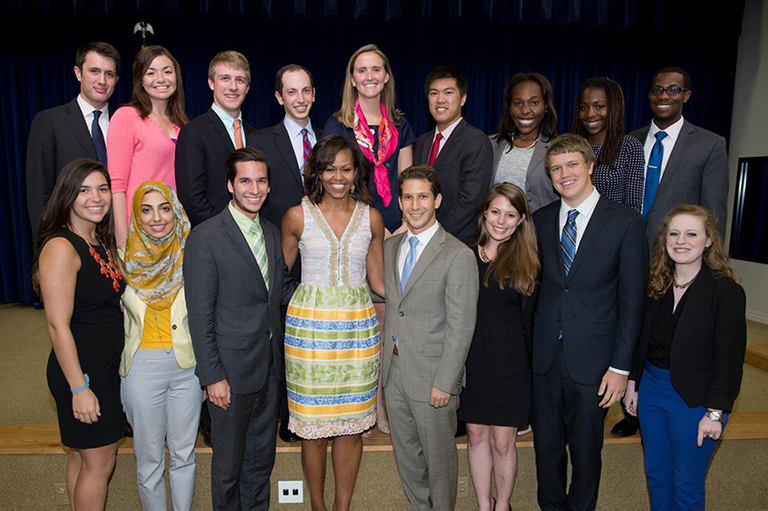 Chesley Swann posing for a picture with former first lady Michelle Obama during an internship at the White House. Photo courtesy of Chesley Swann. His mother's first-hand experience with public policy, her own social activism and the socio-economic divide of a city like D.C. were a huge influence on Swann and his decision to pursue politics. "I was fortunate to live in a middle-class household," he said. "But to see people who come from poverty, people whose ZIP code can determine if they have a meal or not, to no fault of their own, really shaped my interest in public policy. And my mom is pretty engaged and really taught me about history and some of my role models and how hard they worked to make it more equitable for everybody. I see it as my responsibility to engage in that kind of work and to uplift the community." During high school, Swann served as an intern for D.C. City Councilmember Kenyan McDuffie, and he returned to D.C. last summer to intern for Congresswoman Eleanor Holmes Norton. Before coming to IU, Swann also interned at the White House Office of Public Engagement and Intergovernmental Affairs. He said that working under President Barack Obama's leadership was an amazing experience, and one that deepened his passion for public policy. Once at IU, Swann didn't hesitate to put his leadership skills to work by restarting the campus's NAACP chapter, an organization he was involved with back home. His inspiration came from one of his idols, Charles H. Houston, a D.C. native and chief attorney for the NAACP who led the organization's legal fight against "separate but equal" schools, which eventually led to the Supreme Court's decision in Brown v. Board of Education. Swann said IU is too big not to have a chapter and to not provide students an organization that he believes is at the forefront of social issues. It is also a way for students to remember those who came before them, he said. "The history can be painful, so some people turn away from it or they lack full knowledge and understanding of our past," he said. "But to know ourselves and to move forward you have to know your past, including the organizations and people who advocated for you before you were even here. The NAACP is a way to do that and to give back." Swann also knows how difficult it can be to put yourself out there and engage in some of those conversations, especially as a minority. Although he appreciates the tight-knit community Bloomington offers, the city is definitely different from D.C. and has challenged his beliefs from time to time. 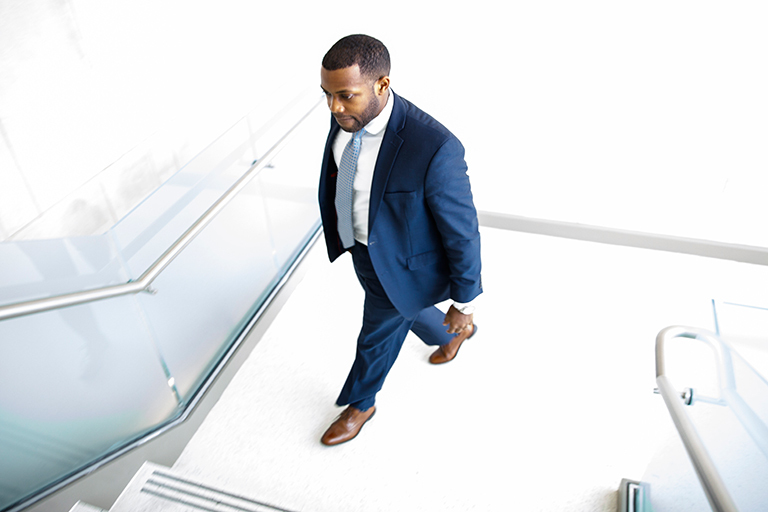 Swann on his way to class at at the School of Public and Environmental Affairs. He recalled engaging in a conversation his freshman year with a white friend who said African-American students had it "easy" and have an abundance of resources available. Swann used the exchange as a learning experience, explaining the barriers some people can face and how difficult it can be for underrepresented students to even make it to college. When asked where his own understanding comes from, Swann credited his family and one of his role models, Robert F. Kennedy, who he saw as a leader who emphasized the importance of bringing people together. "My family always encouraged me to engage with people, to talk to them and try to understand where they are coming from," he said. "Working at the White House, I was also surrounded by problem-solvers and people whose job is to work things out. Dismissing someone doesn't solve the problem. People who have made the most difference in history are people who have sat down and tried to understand the other side." While it can be difficult to be a minority at a university like IU, Swann said all students should know that they belong here. "It definitely takes more effort to put yourself out there, especially as a black student," he said. "But it is worth it. You have to be confident in the end. I'm here on my merits and because I belong here. I'm a part of IU just like any other student. It's knowing who you are and that your perspective matters and speaking up. That is how you do it." Matthew Baggetta, assistant professor at SPEA, has witnessed how passionate Swann is when it comes to helping others and how important it is to have young people like Swann engaged in public policy. "Minority groups face enormous challenges that are often deeply enmeshed in political and social structures," he said. "Improving the situation of those groups will require consistent engagement with politics and the creation of effective public policies. I have no doubt that Chesley -- and other bright, passionate students like him -- will soon be leading those efforts. Our world needs as many people like that as it can get." Swann has also learned a lot about himself outside his hometown and college life. In grade school he traveled to China as part of the D.C. Boys Choir -- his first experience with culture shock. In high school he traveled twice to Ghana as part of a cultural exchange program. That trip, he said, inspired him to do more to give back to those who came before him. 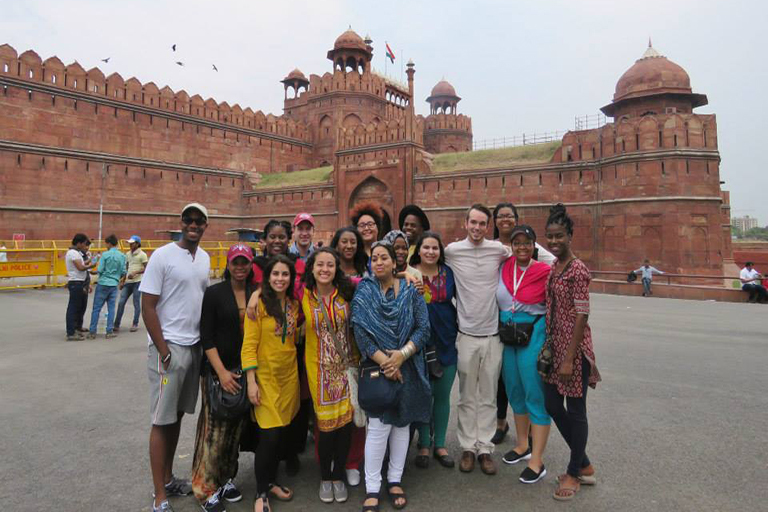 Swann, first on the left, at the Red Fort in New Delhi, India. Photo courtesy of Chesley Swann. When he got to college, Swann said, he didn't think of overseas study as an option for him. But after hearing about the Office of the Vice President for Diversity, Equity and Multicultural Affairs' study abroad program, which provides scholarships to students in office programs, he decided to give it a chance. In 2015, he traveled to India, an experience he said put his own life in perspective. "Traveling to India, I realized how fortunate I am," he said. "Seeing people who can barely survive again reiterated for me how I really want to work in policy and make a change in people's lives. It showed me how fortunate I am to be in America and that I should take advantage of all that I have and use it for the greater good." After graduating in May, Swann plans to return to D.C. to work in local government. He might one day run for office, although he hasn't decided yet. Wherever he is, Swann plans to devote his career to changing people's lives for the better. "I just want to do something where I'm helping underrepresented people with little resources," he said. "I want to give people an opportunity to prosper and for everyone to be on equal footing."